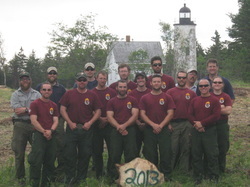 The National Park Service's 2012 Fuels and Ecology Award for Achievement in Promoting Fire-Adapted Human Communities! This is a National award and certainly illustrates the dedication and professionalism of Andy Mitchell, Fred Mason and the whole Acadia management team. Soggy conditions challenged the crews with both safe cutting and effective burning-- while in dry Colorado wildfires raged! Two weeks of living and working together-- and a job well done! Donations included use of a tractor for the duration, a weekend Happy Hour event, a pizza lunch, and a lobster dinner. From the Schoolhouse south. The tower was not visible here before. "The intent of this project is to create adequate defensible space consisting of a fire resistant landscape surrounding each of the structures present on the island. Further it is intended that these objectives be accomplished in the safest manner possible, and with a high degree of sensitivity to the visitor experience, resident concerns, and the park resource." "...The last permanent residents left the island shortly after World War II. Coastal spruce immediately colonized 90% of the island producing dense forest. Isolated birch, poplar, and Mountain ash trees are dispersed throughout. 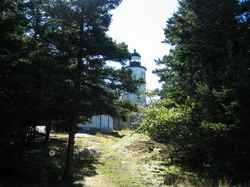 The forest had grown to a height of over 60 feet achieving dense crown closure, completely enclosing the lighthouse and attendant support structures. Though coastal Maine is generally wet, it can and has burned with great intensity, and with very rapid spread rates. The long fire return interval and lack of human intervention has resulted in extreme fuel accumulations. Routine, unregulated island visitation during fire season provides readily available ignition sources. Strong winds from the North Atlantic Ocean are common. Should these factors converge, a wildfire with attendant loss of structures is a very real possibility." 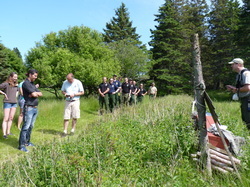 "The Acadia Fire Management Officer and Cultural Resources Specialist partnered to arrive at an acceptable method of creating a fire resistant landscape as suppression response was deemed uncertain given the vagaries of winds, tides, aircraft and boat availability, and weather. Coniferous species would be thinned or removed and deciduous species left in place. The same logistical issues confronting suppression response confronted fuels reduction planning. " "It was subsequently decided that NPS personnel would cut, pile, and burn the biomass to be removed. Numerous partners were enlisted. The University of Maine Forestry students marked the treatment area boundaries. Boat support was provided by the Bar Harbor Whale Watch Company, the College of the Atlantic, and the Acadia NP Maintenance and Visitor Protection divisions. 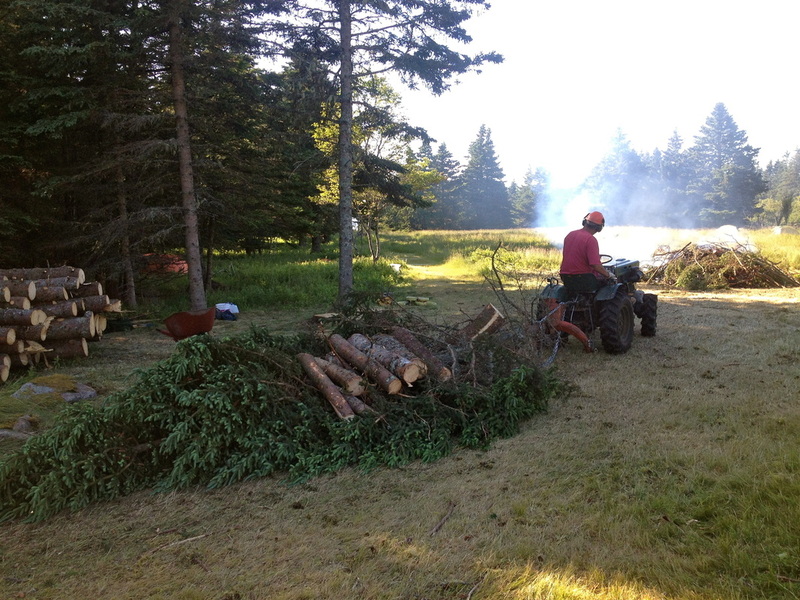 The Keepers of Baker Island friends group provided a tractor and operator to ferry supplies from the landing site at the shore to the camp, and to skid biomass to burn sites. 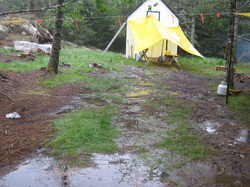 Acadia Interpretation Rangers managed messaging. Numerous public meeting were held with local governing and advisory bodies. " 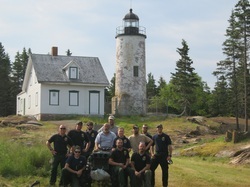 "The Cape Cod National Seashore fuels crew, several Acadia firefighters and nearly three tons of fresh water and supplies were put ashore for twelve days to complete the work. A detailed Incident Action Plan was written to provide guidance. Medivac and Communication plans were given particular attention. 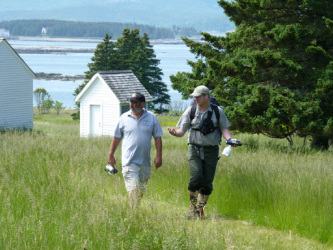 Input from numerous members of the Acadia Resource staff was solicited to ensure sensitivity in the fragile island ecosystem." "Many thanks go to all who participated. The results achieved are as planned, and with an excellent safety record. Defensible space as well as an aesthetically pleasing landscape resulted."